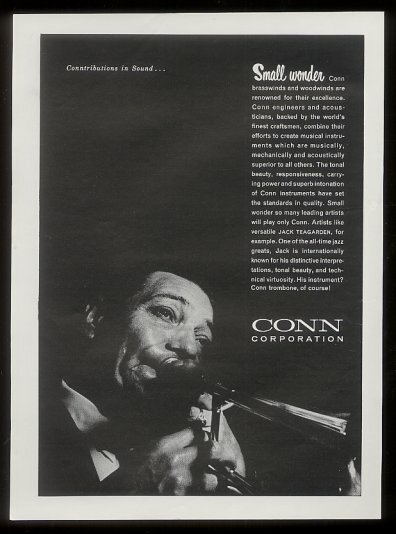 Bring me my Cornet: O clouds unfold! Bring me Lips Page soaring higher! God bless Tom Waller (Fats). You get the picture. Asked to choose between the sound of Dave Tough’s drums in the opening choruses of TAPPIN’ THE COMMODORE TILL and music that evokes “the orderly nature of computer programming,” it’s a hard choice. I’d have to struggle for many nanoseconds to figure it out. I might have to ask my friend Stompy Jones for help. It’s enough to make me want to delete every piece of email unread that comes in without being addressed to “Dear Michael” or “Dear Mr. Steinman.” Music publicists and other cyber-soliciters, take a note from the South: know your audience and address people by name. And for me, I’m going to translate the surreal into music by getting up from the computer and taking a walk with the Beloved. 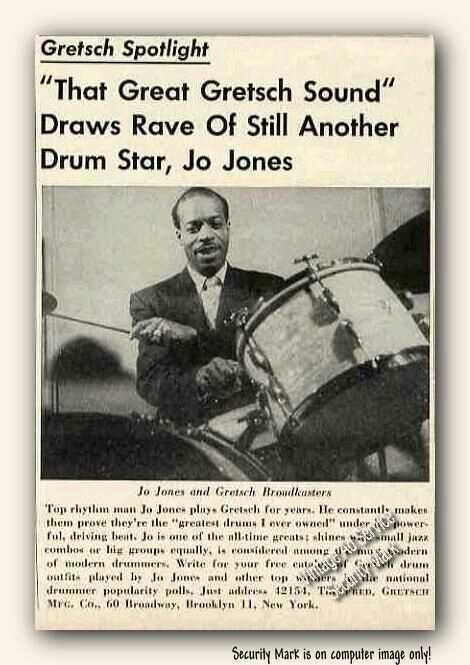 Drummer and jazz scholar Kevin Dorn and I were discussing these historical drum ads at Birdland last week. Although we delight in them, we share the same skepticism. 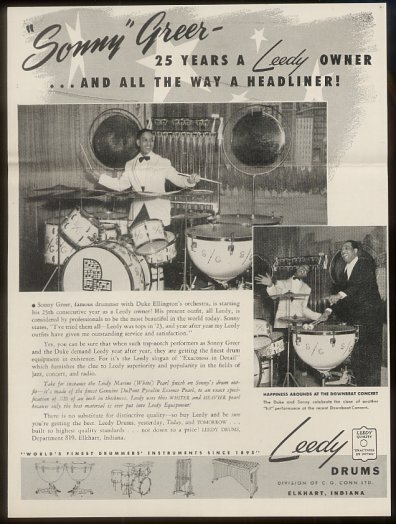 A drum company representative came up to George Wettling, say, and asked, “George, would you like a new set of _ _ _ _ _ drums for free? 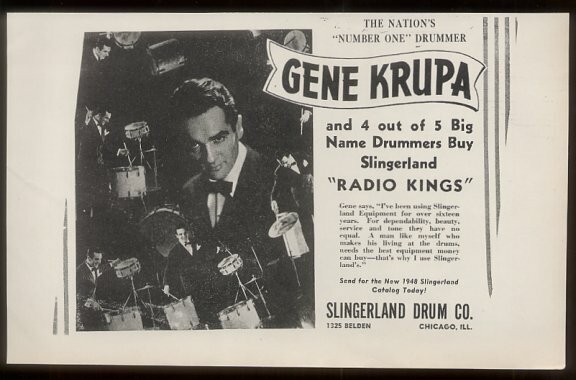 And we’ll give you a hundred dollars to let us use your picture in an ad?” Wettling or anyone else always could use another set of drums, as well as the money, so he posed for a photo behind the set of drums that he swore were his favorites. 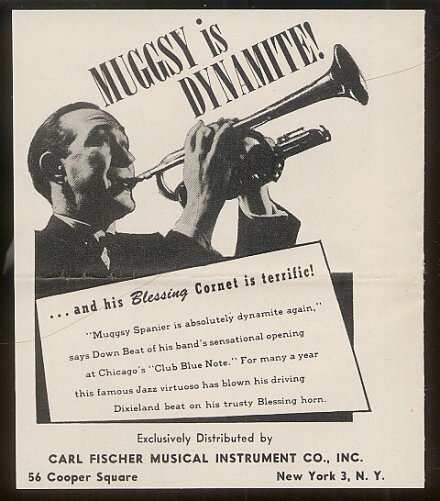 Perhaps a thousand young men went out and beleaguered their parents to buy just that set because their idol played it. 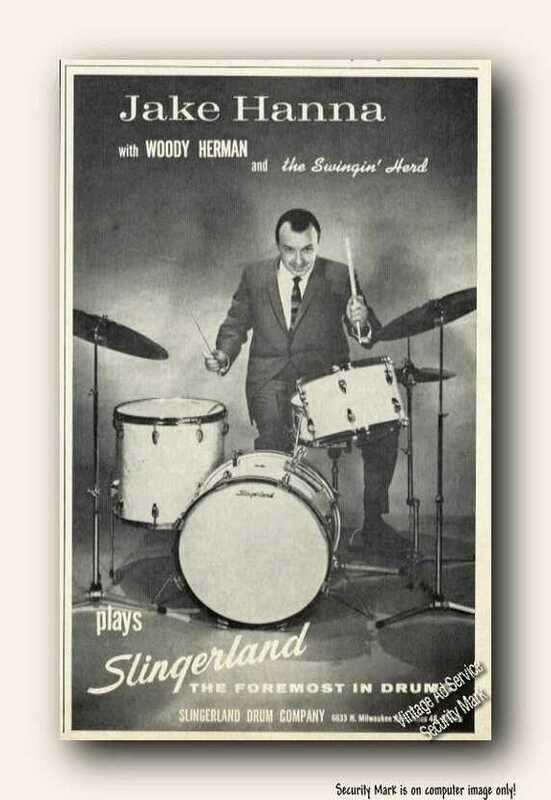 Mildly fraudulent or not, full of language we doubt the drummer himself used, these pages are enchanting. How many times in our lives will we see Dave Tough (not Davey, mind you) advertising something in a magazine — as if people would follow his lead? It suggests a pre-Fall universe, now vanished. This ad (like the Ray Bauduc autograph in the previous post) is available for purchase at eBay. A thrilling oddity, never to come again.